Combine the resources and problems of society in order to generate competitive products internationally through collaborative multidisciplinary work for the fulfillment of the objectives. Apply quality and excellence in academia with foresight and projection for industry. Implement biomedical alternatives to cure diseases. Conserve biodiversity and the ecology of animal species. 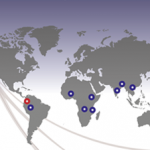 The aim of CLAIM (Centro Latino Americano de Investigación en Malaria) is to generate critical knowledge, provide technical tools and scientific support to the governments of currently participating and future additional countries of Latin America and the Caribbean to strengthen current control measures and facilitate the elimination of malaria. The mission will be addressed through multidisciplinary work of excellence that seeks to accelerate malaria elimination in the region. MULTIDISCIPLINARY RESEARCH NETWORK FOR THE PREVENTION AND CONTROL OF VECTOR-BORNE DISEASES. This proposal is aimed at the creation of knowledge networks in the area of human health. We propose the establishment of THE MULTIDISCIPLINARY RESEARCH NETWORK FOR THE PREVENTION AND CONTROL OF VECTOR-BORNE DISEASES (ETV) composed of public and private universities, foreign and national centers and research groups with support by the Ministry of Social Protection (MPS) of Colombia. In Colombia the most important vector-borne diseases are malaria, dengue, leishmaniasis and Chagas disease. These diseases cause significant morbidity and mortality and represent a significant economic burden for the country. The enormous challenge of control and possible elimination requires a concerted effort between academia, government, organized civil society and the community where control activities are accompanied by agendas of basic and applied research. This will enable prompt responses to the biological, clinical, logistical and economic factors limiting potential impact and creating ineffective government spending. Upon completion of this program of eight years, it will have reached a broad understanding of the problems of malaria and dengue in Colombia, the distribution, the different populations of their vectors and their bionomics, the clinical presentation and immune response and the design of protocols for handling these and other infections febrile illnesses. Upon completion of this program, a multilevel “school” for training of personnel in ETV will also be institutionalized. Working together with the MPS, the Ministries of Health and the malaria control program of the Global Fund, we will demonstrate the impact of this program on the incidence of malaria and dengue throughout its term. Finally, the network will become a tool to guide the design and implementation of strategies for control / elimination raised by government entities to mitigate and solve the priority health problem represented by malaria, dengue and other vector borne diseases. The program will contribute to strengthening national and regional capacities in science, technology and innovation through the convergence of regional, intranational, and international actors and institutions. This will promote the improvement of the health and the quality of life in the Colombian population including a social transformation of the country. Line 1: Define the epidemiological characteristics in areas with high prevalence of malaria and dengue in Colombia. Line 2: Understand the dynamics of transmission of malaria and dengue in endemic areas of Colombia through the study of primary vectors. Line 3: Determine the clinical profile and immune response in animals infected with malaria and / or dengue in areas of high prevalence in Colombia individuals..
Line 4: Establish a reliable platform for the diagnosis of malaria and dengue in Colombia and the study the Plasmodium resistance to antimalarials and designing new treatment regimens. Line 5: Provide education tools to strengthen prevention interventions, control, management and case reporting in the most affected regions.